After learning about the Mexican artist Rodolfo Morales, the children use his style to make collages. For all ages. Plan 2 to 3 sessions. Unlike his paintings, examples of Rodolfo Morales's collages are difficult to find. Click on the following titles for some printable images: "They Even Dance in Heaven," "Just Married," "Polka-dots at Dawn," "Dancing," "The Skeleton's Dance," "Blue Angel," "Untitled." More examples can be found in Morales's book for children, Angel’s Kite. Rodolfo Morales is considered one of Mexico’s most important twentieth-century artists. Although mostly known for his paintings, he had a particular love for the collages that he worked on every morning before starting to paint. Morales was born in the small village of Ocotlan in Oaxaca, Mexico, in 1925. His father was a carpenter, and his mother taught school. As an only child, Morales was a timid boy who invented solitary games to play by himself. At an early age, he realized his ability to draw and became a careful observer of the world around him. After receiving a degree from the Academia de San Carlos in Mexico City, Morales spent thirty-two years teaching drawing to high school students. Encouraged by a fellow teacher to display his artwork, he had his first exhibition in 1975. Renowned artist Rufino Tamayo saw the exhibition and with his support, Morales became critically acclaimed and recognized for his paintings. At the age of sixty, he sold enough of his work to return to his native village of Ocotlan to paint full time. Morales's art is about the life, landscapes, and mythology of his village. He often used scenes from his paintings in his collages - a medium in which he felt freer to experiment. 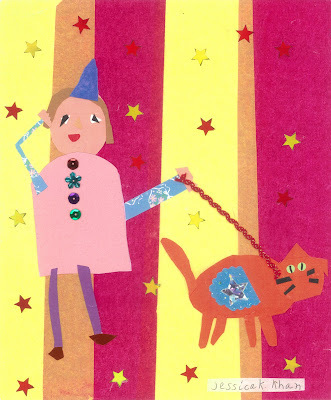 The vibrant and playful collages are composed of paper, cloth, ribbons, colored stickers, and other unrelated items. They are delicate, humorous, and on the verge of abstract, although they always include recognizable elements. The most important symbol seen throughout his work is disproportionately large hands, which gesture like an unspoken language attempting to communicate directly with the viewer. In the true Zapotec Indian tradition of sharing your good fortune with others, Rodolfo Morales used his wealth to give back to his community. He established a foundation for the youth of Ocotlan, turned his home into a cultural center, and financed the planting of trees and the restoration of many churches in the state of Oaxaca. In 2001, Rodolfo Morales died at the age of seventy-six. Small strips of white paper and pencils for signing the collages in the style of Morales. Become familiar with the life and collages of Rodolfo Morales. Gather examples of Morales’s collages. Set out 10- x 12-inch white paper. Set out scissors, glue sticks, and the variety of papers for cutting. Have available the miscellaneous items. Explain to the children that a collage is an artwork made by arranging and gluing materials to a single, flat surface. Tell them about Rodolfo Morales and share examples of his collages. Explain that in the next several sessions they will be making collages using Morales’s style. - The themes, or stories, are fun and playful. - Hands are over-sized and usually have colorful, round finger nails. - Outlines, or the lines around the shapes, are often defined with pieces of string. - Backgrounds, or the parts of the picture against which the figures are placed, are filled with a variety of papers. - Details are made with miscellaneous items such as stickers, ribbons, and string. - Morales signs his collages by writing his name with pencil on a piece of white paper and gluing it onto the artwork. Have the children plan themes or stories to tell in their collages. Explain that in this session they will first be making the backgrounds for the collages. Show them how to apply glue directly to the back of the items to be attached rather than to the white background paper. 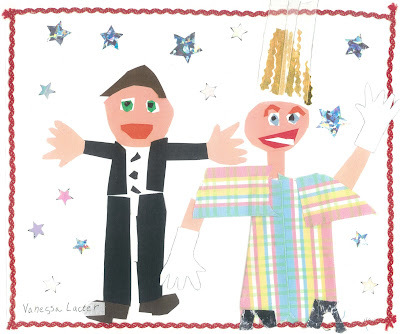 Once the backgrounds are completed, the children can begin to cut materials for the figures in their collages. Remind them to choose colors with enough contrast to show up against the backgrounds. The figures and details should not be glued onto the collages until they are completed in the next session. Note: Fold the newsprint paper in half to make folders for storing individual projects between sessions. Set out the miscellaneous items, the paper for cutting, and scissors. Set out glue sticks, slightly dampened sponges, and containers of liquid glue with brushes. Set out the work from the previous session, hole punch, and pinking shears. Set out strips of white paper and pencils for signing the collages in the style of Morales. Explain to the children that in this session they will be adding figures and details to their collages. Discuss again Morales's playful themes in his collages and the use of such materials as lace, ribbon, sequins, etc. Demonstrate how to use pinking shears to make decorative cuts in the papers or fabrics, and how to use a hole punch to make round finger nails for the over-sized hands. Review with the children how to attach materials to their collages with glue sticks. Some items, such as string and sequins, are easier to attach with liquid glue. Emphasize using only as much glue as necessary. Sticky fingers can be wiped with slightly dampened sponges. Have the children cut out and attach the figures and details to their collages. To sign their work in the style of Morales, the children can write their names on strips of white paper with pencil and glue them to their completed collages. 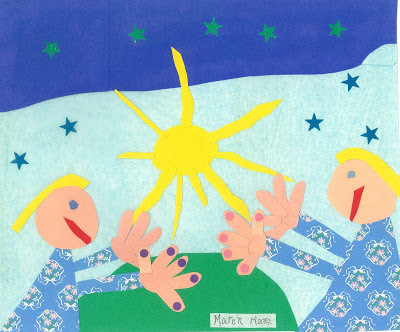 When children make collages, it often becomes an exercise in cutting and pasting without a deeper understanding of the sophisticated process. Morales's collages make good examples for children because they are able to relate to their charm and humor. 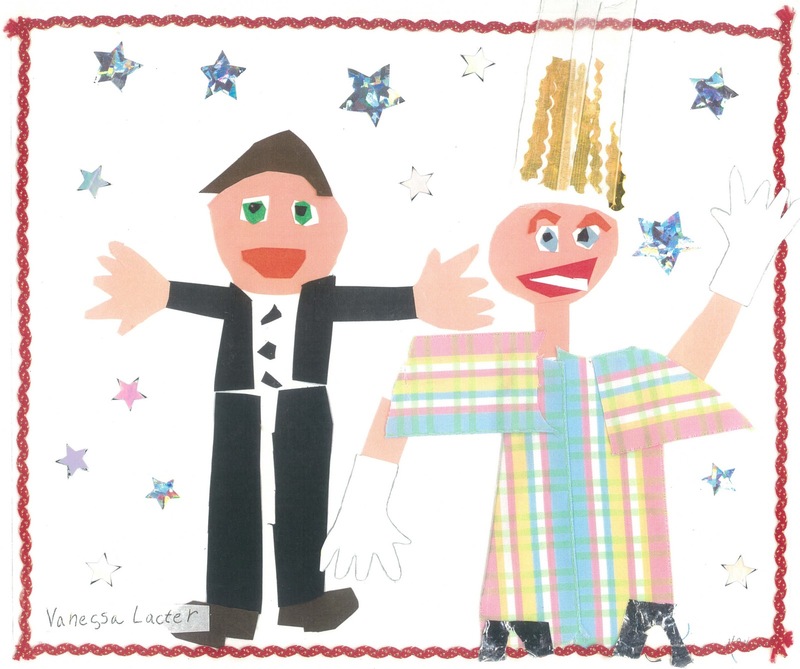 Have the children use their own themes for their collages while learning about the use of materials and the sense of playfulness in Morales's work. Young children seem to have an innate sense of composition. When working with ages three to six, a discussion about planning use of the whole paper or what might be missing in certain areas works well. As the children get older you will need to address balance of color and design in their compositions. Shiny star stickers will be very popular. You might want to save them as the last items to be attached to the collages. The titles for Morales’s collages are humorous and informative. It’s fun for the children to title their works. 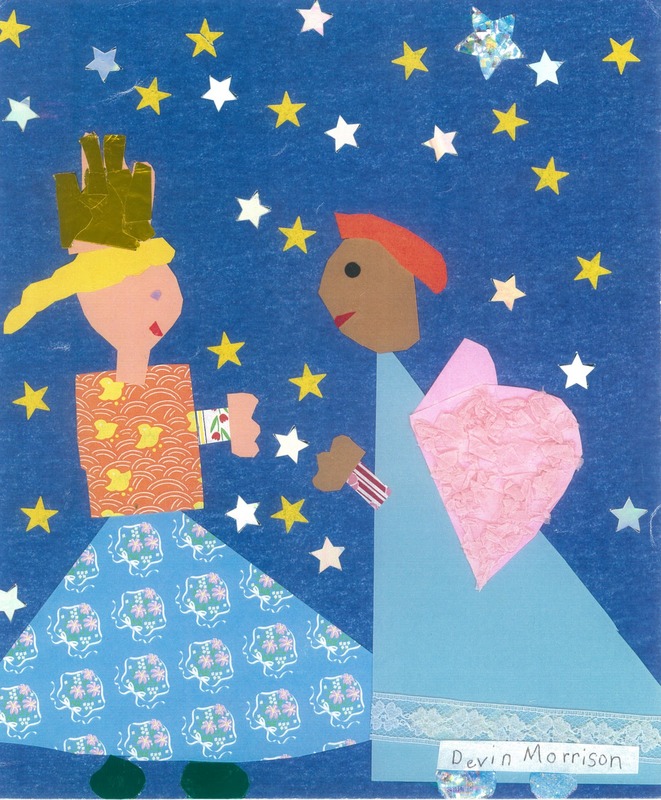 Have the children discuss the themes or stories in their collages. Do the designs fill the papers? Are the materials carefully glued onto the background paper? I want my background to be white, so can I glue on my people now? I didn’t have time to glue my background shapes to my paper. I’m afraid I will lose them. It’s hard to put the glue on my crumbled pieces of tissue paper for my angel’s wings. I have glue all over my fingers. My scissors won’t cut this fabric. I named my collage “My Little Angel” because that’s what my mother always calls me. When you have completed cutting out all your shapes and decided where you want to place them on your paper, you can use the glue. Carefully place all your cut pieces in the folder with your name. I will store them for you until the next session. Occasionally you will need to put the glue directly on the background paper. Be careful to put the glue only on the area you want to cover with the crumbled tissue paper. If your hands are sticky, wipe them on the dampened sponge on your table. If you are having trouble cutting the fabric, I can help you with my sharper scissors. That will make your collage very special!